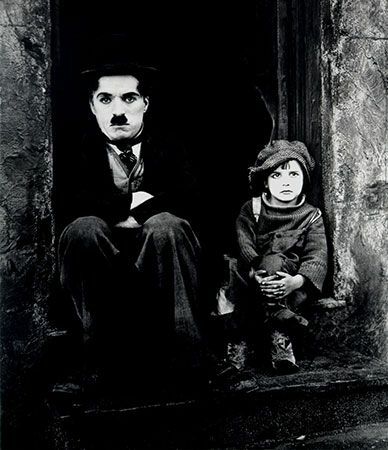 Chaplin was named after his father, a British music-hall entertainer. He spent his early childhood with his mother, the singer Hannah Hall, after she and his father separated, and he made his own stage debut at age five, filling in for his mother. The mentally unstable Hall was later confined to an asylum. Charlie and his half brother Sydney were sent to a series of bleak workhouses and residential schools.Using his mother’s show-business contacts, Charlie became a professional entertainer in 1897 when he joined the Eight Lancashire Lads, a clog-dancing act. 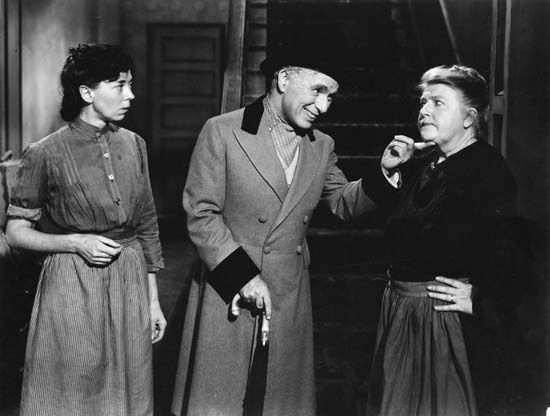 His subsequent stage credits include a small role in William Gillette’s Sherlock Holmes (1899) and a stint with the vaudeville act Casey’s Court Circus. In 1908 he joined the Fred Karno pantomime troupe, quickly rising to star status as The Drunk in the ensemble sketch A Night in an English Music Hall.While touring America with the Karno company in 1913, Chaplin was signed to appear in Mack Sennett’s Keystone comedy films. 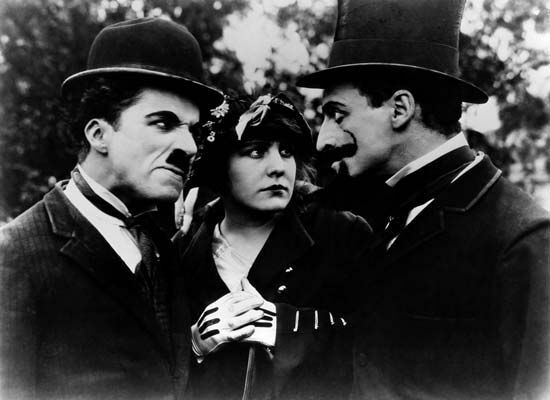 Though his first Keystone one-reeler, Making a Living (1914), was not the failure that historians have claimed, Chaplin’s initial screen character, a mercenary dandy, did not show him to best advantage. 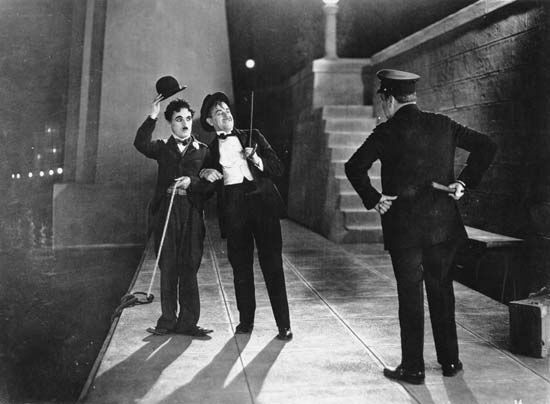 Ordered by Sennett to come up with a more-workable screen image, Chaplin improvised an outfit consisting of a too-small coat, too-large pants, floppy shoes, and a battered derby. As a finishing touch, he pasted on a postage-stamp mustache and adopted a cane as an all-purpose prop. It was in his second Keystone film, Kid Auto Races at Venice (1914), that Chaplin’s immortal screen alter ego, “the Little Tramp,” was born. 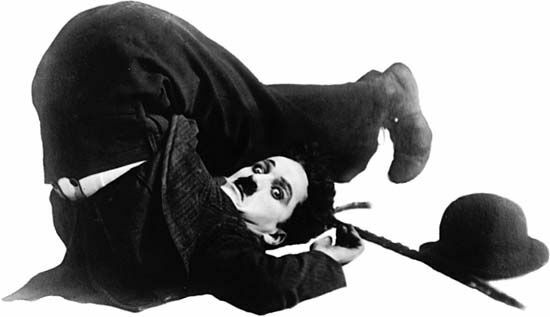 His 35 Keystone comedies can be regarded as the Tramp’s gestation period, during which a caricature became a character. 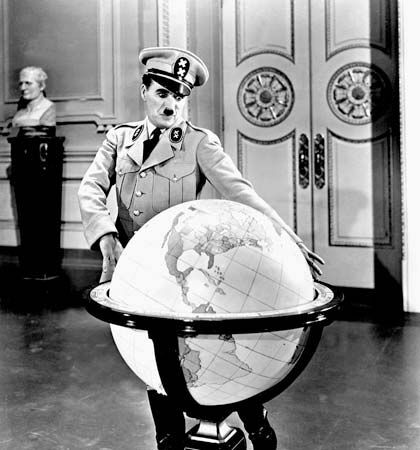 The films improved steadily once Chaplin became his own director. In 1915 he left Sennett to accept a $1,250-weekly contract at Essanay Studios. It was there that he began to inject elements of pathos into his comedy, notably in such shorts as The Tramp (1915) and Burlesque on Carmen(1915). He moved on to an even more lucrative job ($670,000 per year) at the Mutual Company Film Corporation. There, during an 18-month period, he made the 12 two-reelers that many regard as his finest films, among them such gems as One A.M. (1916), The Rink (1916), The Vagabond (1916), and Easy Street (1917). It was then, in 1917, that Chaplin found himself attacked for the first (though hardly the last) time by the press. He was criticized for not enlisting to fight in World War I. 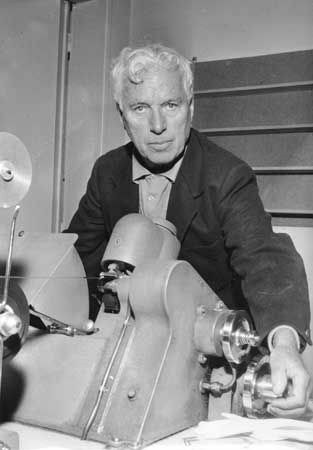 To aid the war effort, Chaplin raised funds for the troops via bond drives. 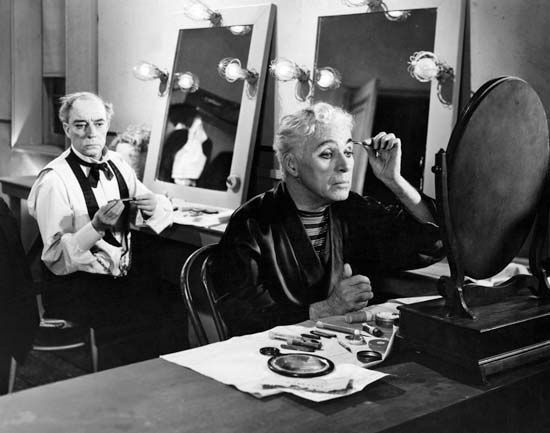 His darkest comedy, Monsieur Verdoux, was released in 1947, and by then Chaplin was in the headlines again, as possibly being called before the House Un-American Activities Committee (HUAC) to testify about his relations with communists, especially exiled German composer Hanns Eisler. Chaplin starred in that “Comedy of Murders” (as Monsieur Verdouxwas promoted) as Henri Verdoux, a happily married father and former bank clerk who becomes the scourge of 1930s Paris by romancing and then killing a series of rich widows and spinsters for their fortunes. (Chaplin’s character was based on French murderer Henri Landru, who was known as the Bluebeard of France when he went on his killing spree during the 1910s.) 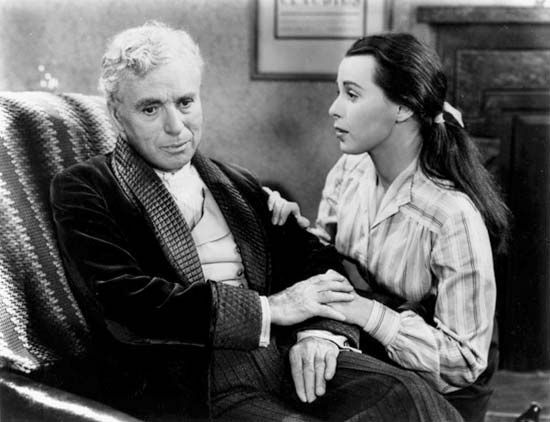 Monsieur Verdoux was an utter failure commercially upon its release—his first since A Woman of Paris 24 years earlier—and critical opinion was divided, although Chaplin’s screenplay was nominated for an Oscar. It is still difficult to determine whether Monsieur Verdoux would have been better received had he not been suffering from the attentions of HUAC. 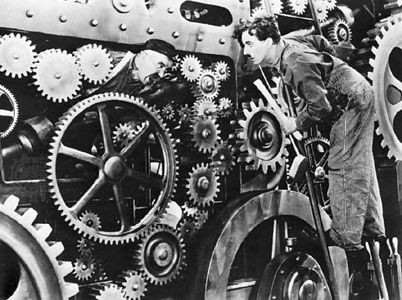 When Chaplin heard news that he would be summoned before the committee, he immediately accepted, saying, “I am not a communist. I am a peacemonger.” He planned a rerelease of Monsieur Verdoux in Washington, D.C., for the week Eisler was to testify before HUAC, and he invited the committee members to the premiere. However, HUAC chairman J. Parnell Roberts canceled Chaplin’s appearance and said he would not be a part of publicity for Monsieur Verdoux.